Made to order in New Zealand. created this signature style in 2001. My signature style (name on side, head and shoulders portrait) is one I've been known for since 2001. 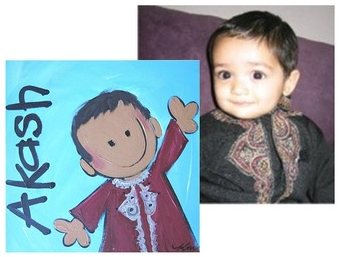 ​Send me your photo and I'll try to match the hairstyle, and will do your background colour that you request. If u have extra ideas you'd like me to paint please let me know and I will see what I can do.. I use quality artist's acrylic paint, and each work is sealed in clear gloss acrylic for added protection from the sun and scratch marks. These won't fade. Just wipe clear with a damp cloth to remove any dust or so. Canvas is stretched over 3cm wooden frame, lightweight, easy to post and to hang. If you require different sizing please let me know and I'll give you a quote. 2. Send child's name and colours you'd like and any other info that might add to the character. 4. I'll paint what you request, and send it to you within 21 days from payment confirmation. Please send me feedback, as this important to me.